The Picayune/KBEY 103.9 FM Radio Picayune Toy Drive is 6 a.m.-3 p.m. Wednesday, Dec. 6. MARBLE FALLS — Kay Baker remembers moving to the Highland Lakes as a young mother with her family, including her then-young son. Those first couple of Christmases were tough financially, and she didn’t always have the resources to make sure her son enjoyed a special Christmas morning. 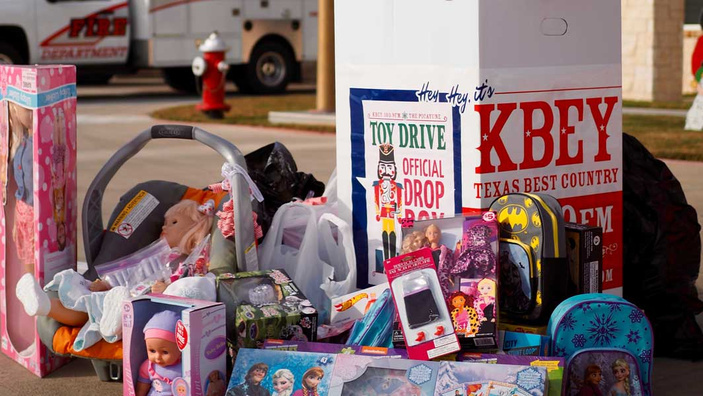 That’s where organizations such as Highland Lakes Christmas is for Kids and Burnet County Santa’s Helpers make such a difference. It’s also a big reason Baker gets behind the annual The Picayune/KBEY 103.9 FM Radio Picayune Toy Drive, slated for Wednesday, Dec. 6, this year. Along with Highland Lakes Christmas is for Kids and Burnet County Santa’s Helpers, the toy drive is adding Granite Shoals Christmas Outreach to its list this year. People can stop by several places from 6 a.m.-3 p.m. the day of the drive to drop off toys or monetary donations. KBEY, The Picayune staff, and volunteers will be at Chevy-Buick of Marble Falls (where you’ll find Kay and Ed) at 2301 U.S. 281 North in Marble Falls; the Burnet Fire Station, 2002 S. Water St. (U.S. 281) in Burnet; and Crazy Gals Cafe, 8037 RR 1431 in Granite Shoals. Chandler’s a big advocate of the toy drive, but not because he’s received help from one. He’s seen firsthand how it can make difference in the lives of a family, particularly children. After the toys were collected and ready to go out, Chandler often put on the Santa suit and helped deliver them to families. “It was really amazing how big a difference getting toys on Christmas could be for the kids,” Chandler said. To help spread that cheer, all you have to do is roll up to one of the three sites listed and drop off the toys. Chandler said it doesn’t matter if all you have is $5; it can help. “Even if it’s a dollar, it’s so appreciated,” he added. Along with the drop-off spots on the day of the drive, people can donate toys at several businesses across the Highland Lakes now through the Dec. 6 toy drive. Those locations are: Whataburger, 1204 U.S. 281 in Marble Falls; Which Wich, 311 U.S. 281 in Marble Falls; Koko FitClub, 1400 RR 1431 in Marble Falls; Atkins Pharmacy, 701 Third St. in Marble Falls; Crazy Gals Cafe in Granite Shoals; Real Property Management Highland, 407 Main St. in Marble Falls; Bulldog Bodywerks, 1304 Buchanan Drive in Burnet; H&R Block, 1115 RR 1431 in Marble Falls; and Hill Country Auto Glass, 1100 Buchanan Drive in Burnet. Check ThePicayune.com or KBEYFM.com for an up-to-date list throughout the week. Chandler pointed out that, over the years, the Highland Lakes community has looked out for each other, and this is another way to do just that. Baker offered one request, though. I missed the toy drive when I was out of town. Is it possible to still donate toys?